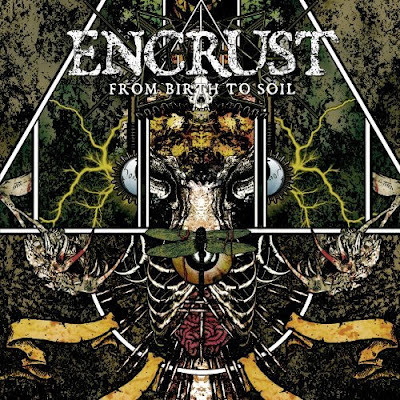 Discussions Magazine Music Blog: ENCRUST/From Birth To Soil: Available September 25th, 2012! ENCRUST/From Birth To Soil: Available September 25th, 2012! The Chicago quintet merges the two seamlessly on its debut album, From Birth To Soil, available September 25 via Density Records. Siphoning guttural growls through catchy riffs and an extreme percussive stomp, the group Chris Angelucci, Luke Tobias, Ryan Kasparian, Jeremy Pyrzynski, and Brian Kutanovski pummels unlike anyone else on the scene. Encrust formally came together in May 2010. As he was driving home from work one night, Pyrzynski received a call from a friend suggesting he hit the studio with the band to record a three-song demo. From the moment he jammed with the other four members, the chemistry proved instantaneous and inimitable. That infectious intensity also remains a pillar of the band's live shows. They've shared the stage with the likes of everyone from Red Fang and Corrosion of Conformity to Goatwhore and Exhumed, and the result is always a bloodthirsty battering of the highest order.